Whoop it up at Carlos’n Charlie’s in the Flamingo. Newly opened, this bar caters to the lively, loud, energetic crowd. Traditional Mexican cuisine or selections of American favorites are served in a casual, friendly setting. 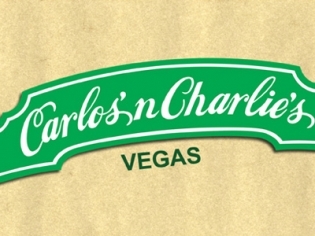 Whoop it up at Carlos’n Charlie’s in the Flamingo. This bar caters to the lively, loud, energetic crowd. Traditional Mexican cuisine or selections of American favorites are served in a casual, friendly setting. Enjoy your meal in the restaurant, on the terrace overlooking the gardens, or in the lively bar. Tunes from the 70’s, 80’s and today will entice you to take the dance floor and unwind. Carlos’n Charlie’s will please the most enthusiastic of partygoers. The menu offers a wide variety of authentic Mexican favorites such as tacos, burritos, chimichangas, enchiladas, fajitas and other traditional Mexican fare. Guests can also create their own tableside guacamole with Carlos ‘n Charlie’s interactive guacamole cart, for the perfect unique blend. A selection of American favorites such as Chipotle BBQ ribs, burgers and spicy chicken wings is also offered. Happy hour is 2–6 p.m. daily with two-for-one deals on frozen house margaritas and Coors Light drafts. Breakfast served 8am – noon. The food was not good. Trust me, this is not the place to eat. I love the flamingo, we stay there every trip. But I can’t recommend this place. Skip it, you will thank me later. We had just checked in and needed to eat. We thought this was just a restaurant. It is so much more. When you hear sirens go off, then dance music comes on and the wait staff lines up within the restaurant and start doing a line dance. My fiance asked for ketchup and our waiter called out across the restaurant for ketchup and all the wait staff came running over to place a bottle if ketchup. They have a great outdoor patio too. We had a great time and liked the food too. Margaritas were really good too. If you are looking for a fun place to eat or go for a drink, then this is the place. Never have written this bad of a review before. Had reservation and was seated promptly. Downhill from there. Waiter got drink order wrong, then our entrees show up before our appetizer. How can chips and salsa be late? My entree was cold, wife’s was warm. When told waiter that I was dissatisfied he went to mgr who simply took my meal off bill. Never came to table to check on problem. We were REALLY looking forward to this meal and were totally disappointed. We will never go back.